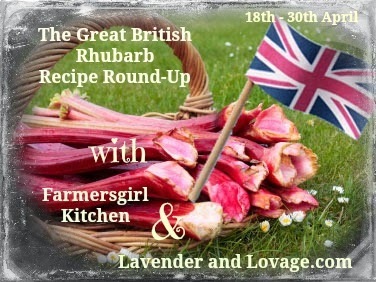 Farmersgirl Kitchen: The Great British Rhubarb Recipe Round-Up! The Great British Rhubarb Recipe Round-Up! If you put your post on twitter please mention @FarmersgirlCook @KarenBurnsBooth and #GreatBritishRhubarbRecipes in your message and we will retweet all those we see. By entering you are agreeing to let us use an image from your entry on this site, and to pin to Pinterest. Please be respectful of other people's copyright and give credit where it is due. Add your recipe link to the live Linky posted at the bottom of this page. Me too, let's do the rhubarb rock! The climate in California is not too good for rhubarb! The cold and damp of Scotland is perfect for it. I hope you manage to find some rhubarb and thanks for your kind comments and support. Such a great idea!!! I baked a rhubarb cake last weekend so will post it and join in soon. Aw thanks Jane, lovely to have you on board.